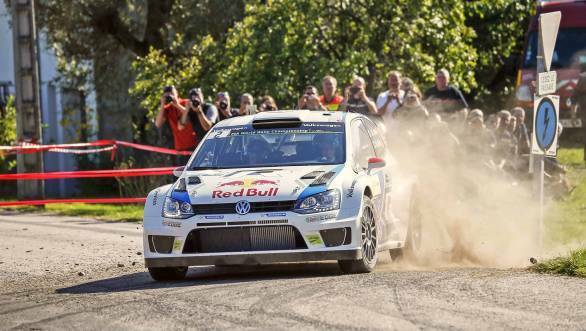 Finally VW driver Jari-Matti Latvala has won his first asphalt world championship rally, his fourth win this season, making up for his last day heartbreak retirement when leading the all-asphalt Rallye Deutschland two rallies ago. 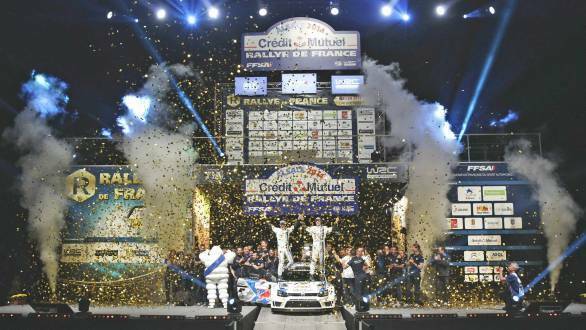 He led the Rallye de France from the third stage to the finish, the first Scandinavian to win this WRC event for 30 years, mathematically still in the hunt for the world drivers' title by one point with two rallies to go. Championship favourite Sebastien Ogier lost time with an electronic problem early on Day 1, compounding his troubles with a time control error immediately afterward. His only points from France came from winning the Power Stage at the end of the event. Citroen driver Kris Meeke scored his fourth podium place of the season, while a battle for fourth place was finally resolved in favour of Dani Sordo's Hyundai after Robert Kubica went off the road on the final stage. Two titles were won at the event, Stephane Lefebvre taking the FIA's Junior and WRC3 championships by cruising to the finish. There seemed little doubt that Sebastien Ogier would win a second successive overall world rally championship in France but his hopes were immediately dashed when a gearshift sensor failed, leaving Latvala with the task of driving fast and steadily through the event to win. While Ogier was put into tick-over mode waiting for the Power Stage to come, Andreas Mikkelsen demonstrated his capability by consistently scoring times challenging Latvala, waiting to see if Volkswagen would be able to keep their current 1-2-3 championship drivers' standings through to the end of the season. The remaining championship threat comes from Mikko Hirvonen and only Kubica's retirement suddenly kept Hirvonen in contention for third place. While VW has already won the Manufacturers' title this year, the race is now on for second place between Citroen Total Abu Dhabi, M-Sport and Hyundai, with Kris Meeke maintaining Citroen's hopes, but his teammate Mads Ostberg again had mechanical problems. Ostberg had been lying fifth overall on Day 2 before transmission troubles slowed him, with handling trouble from a leak from a differential dropping him to seventh. A replacement differential was fitted for the final day, but fitted with a different set-up and Ostberg had to fight hard to keep that position, but joining Sordo and Kubica as one of only three non-VW fastest stage times scorers on the event. At M-Sport Elfyn Evans was the star of the occasion, holding a most impressive fourth place on Day 1 before he suffered from another Fiesta alternator failure, costing him 1m40s penalty - and a very exhausting effort by the crew to push the car into the service area. In the fiercely-contested battle for places behind the Volkswagen cars and Meeke's Citroen, Evans drove well eventually to finish sixth. Another impressive display was the speed of Kubica, whose wildness was spectacular with lurid moments on stages 5 and 10, before sliding off the road for good on the Power Stage when fourth. All this overshadowed the efforts of Mikko Hirvonen, who lost a lot of time early on with set-up errors but he finished the top placed Ford driver. All the Hyundais finished in the points, but their three drivers were not fully confident with the handling over the often bumpy but fast surfaces, though Dani Sordo was lying fourth overall for some time. Thierry Neuville had turbocharger problems on the first morning of the event, having to pull back from 21st to eighth at the end, while Bryan Bouffier had consistently been lying in the top ten on an event in which only one World Rally Car driver (Kubica) failed to finish. Perhaps the lasting memory of this event is going to be the disasters for the French drivers. The damage to national rally pride was astonishing. Only seven foreign drivers had ever won the Rallye de France before and the French Federation proudly and enthusiastically supports its young talents, the memory of 2004 when Sebastien Loeb was the only French driver to finish in the top five places into sharp focus. Ninth placed Bouffier was the only French driver in the top ten! The only conceivable explanation was that some of the route this year was new. But hope springs eternal. Ogier is surely about to become the eleventh successive world title holder, but the FIA's prestigious Junior series was won during this event by the Frenchman Stephane Lefebvre, with one event still to go. There are two more WRC rallies are still to come, Spain (half gravel then half asphalt) and then the traditional cold and wet Rally GB held on gravel forest roads, and many more prizes to be decided. Only eight championship competitors entered WRC2 in Rallye de France and of these only Bernard Sousa, Sebastien Chardonnet and Pontus Tidemand were in with a chance of the title. Quentin Gilbert was challenged by both Tidemand and Sousa but finally won the category despite power steering and differential troubles. Tidemand lost time when he rolled after touching a course marking bollard and Sousa lost his chance to fight Gilbert on the final morning when he spun. Chardonnet lost touch with the leaders when he had a puncture and with this any hope of the title. Meanwhile Tidemand had not entered Catalunya so that meant the drivers still able to be champion were down to Bertelli, Kruuda, Ketomaa, Al Attiyah and Sousa. Most of the stars of the series will be emerging for Catalunya Rally. Neither of the possible Production Car Cup winners took part in France but Juan Carlos Alonso is entered in Spain. Of the other WRC2 competitors Marti McCormack was the only retirement after he went off the road. Frederic Hauswald was a newcomer to WRC3 and he led the category for nearly all of Day 1 but then stopped on the final stage with fuel pump failure and could not restart the next day. The lead was then taken over by Alastair Fisher chased in turn by Quentin Giordano, Martin Koci, Stephane Lefebvre and Eric Camilli. Lefebvre eased his pace to ensure he finished and clinched the WRC3 and also the Junior titles. Kornel Lukacs and Simone Tempestini both went off the road on Day 1 and were unable to continue, Koci missed stages with brake trouble. Unusual competitor was Guadeloupe driver Alain Pyrame in a Renault Clio Turbo entered in WRC3 but not in the Junior series, but he retired after rolling his car. With Volkswagen secure in top place in the Manufacturers' series, the battle for second is still very close with just eighteen points separating Citroen, M-Sport and Hyundai. Ogier is still favourite to take the Drivers' title but Latvala can still mathematically do it, while Mikkelsen and Hirvonen are both still able to take third place. At this stage in the championship 13 points still cover four drivers lying 4th-7th in the standings.